Lovely modern and well-equipped house on award-winning "The Bay" development. SEA URCHINS beach house is a New England Style "Nikki" Beach House on the prestigious "The Bay" development. Built in 2014, it is modern, with everything you need to make your holiday a relaxing and enjoyable experience. In the open plan area there is a large sofa, arm chair and bean bags, dining table and 5 chairs, and a fully-equipped kitchen for self-catering. Down the hall are the two bedrooms (one with a king-size bed and one with full-sized bunks and a trundle bed for the 5th guest if needed, preferably children only). There are 2 ensuite shower-rooms. TV/DVD/CD players in both bedrooms and the lounge. Digital radio with iphone dock. Free unlimited wifi. Travel cot and high chair provided for baby if needed. To the outside is a drive which can accommodate 2 cars, a private deck with table and seating for up to 8, and a great communal outside lawned area for playing games (provided) or relaxing in the sun. 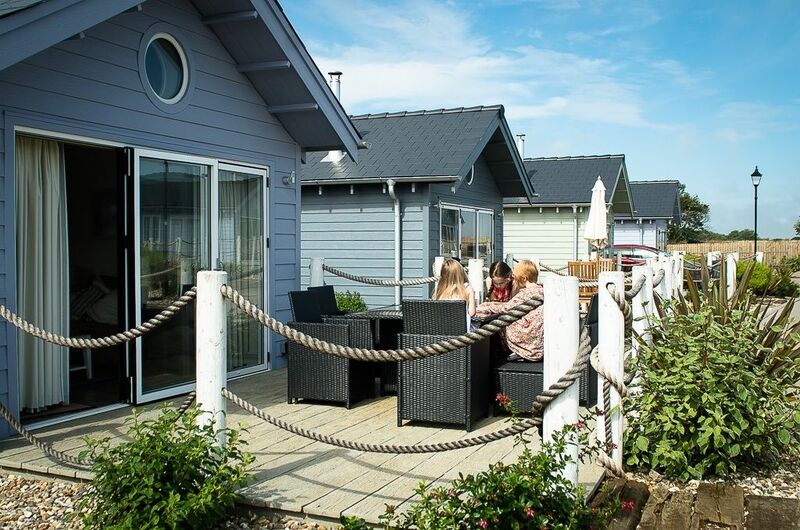 Sea Urchins Beach House is situated on the Bay development, an award-winning holiday park on the Yorkshire coast, with private access down to the beach. The Bay is a great base for those who enjoy sports or outdoor activities - you will have free access to the large heated indoor pool, toddler pool, sauna/steam room and gym. There's also a small playground, football pitch and boules courts. Other activities are available on site for a small charge - archery, fencing, beauty treatments/massage, table tennis, tennis, putting green, aqua-aerobics and other pool activities. The site has a fishing lake, wild meadows and ponds for nature lovers. The Bay also offer bikes for hire, and other seasonal activities (e.g. lake kayaking). On site there is also a public house, cafe/restaurant (sometimes seasonal), and pharmacy, a new Family Entertainment Centre (amusements). From the Bay, you can walk along the beach to Filey. You are also only a short drive from Bridlington, Flamborough, Bempton Cliffs, and Scarborough. Slightly further afield are Whitby, Robin Hood's Bay, York and the North Yorks Moors. We are Paula and Tim Foster. We live in Sheffield, South Yorkshire. We bought this holiday home in spring 2014 for both our personal use for regular holidays with our 3 school age children and as an investment property. We stayed in an apartment on The Bay development in summer 2013 after hearing good things about it from friends who had stayed there previously. On our last day, we visited the sales office, and had a tour of their beach house show home, and the rest, they say, is history! We bought our beach house off plan, and chose the location as it was really convenient to the resort centre (1-2 mins walk) but on a quiet cul-de-sac with lots of communal green space for the children to play out on. We were introduced to the resort of Filey around 7 years ago and we have holidayed there nearly every year since. The beach is excellent - clean, sandy and not too crowded. We have spent many happy days building sandcastles, paddling in the sea and playing beach cricket. The town of Filey has a variety of small shops and cafés, and glen gardens park is excellent for children. We like the fact you can walk easily from one end of Filey to the other, down to the harbour to watch the fishing boats and play in the arcades, or up into the country park to get some great views. We have our favourite places to visit - Sewerby Hall (with a small zoo), Bempton cliffs RSPB, Flamborough, Scarborough and Whitby (including the steam railway to Pickering). All within a short drive. "Sea Urchins" beach house is really close to the resort centre, so it's really easy to go for a quick dip in the pool, pick up a pizza from the cafe or go for a drink in the pub, all 2 mins walk. There are only a few beach houses on the site, and they really are special. The bifold doors open up fully to let that sea breeze in. The pitch of the roof gives a lot of ceiling height in all the rooms, which are all decorated and furnished in the New England style. The kitchen contains a large fridgefreezer, dishwasher and washer/dryer, so everything you could need. We have left a selection of beach toys, toys, jigsaws, books and DVDs for our guests to use. The house has the additional benefit of a large outside store, which means more space for you inside the house, and lots you can borrow from us whilst you are staying. Ensuite wet room with walk-in shower to master, ensuite with shower cubicle to second bedroom (with additional door leading into hallway). Both with sensor-controlled lighting and fan, and heated towel rails. Central-heating and hot water via combination boiler. All beds made up for the required number of guests before your stay. Winter and summerweight duvet options too. No cot bedding provided, so please bring your own if you plan to use the travel cot. Washer/dryer provided (in kitchen area). Also a drying rack provided for drying outside (on deck) or elsewhere in house if preferred. A hand towel and bath towel provided for each guest (except babies). You have a free pass to the communal gym located upstairs in the leisure centre. There are running machines, rowing machines, bikes, cross-trainers, and weight machines/free weights. Bright open-plan living/dining/kitchen. 3-seater sofa, armchair, 2 bean bags, freeview TV/DVD player, radio with iphone dock, dining table and chairs. Doors open onto east-facing deck, ideal for breakfast/lunch outdoors. DVDs, books, toys and games. Multi-programme dishwasher and dishwasher tablets provided. Tall fridge with 3 drawer freezer. Fully equipped including childrens dishes and cutlery. All 3 TVs have a built-in DVD player. We also leave a selection of childrens and other DVDs in the house for you to borrow. Board games, dominoes, cards, jigsaws provided in sideboard. Good selection of childrens DVDs, as well as other films. Communal grounds. Grassed area at rear with trees, shrubs and plenty of space for a game of football, cricket, or boules (all provided in the outside store). Available on the lake in summer season. Decked area at front of house for al fresco dining. Table with 4 chairs/4 stools provided. Cushions for added comfort also provided (in the outside store). Court for hire just a couple of minutes walk away. £5 for 30 mins (2016 prices). Raquets and balls provided if needed. Book at leisure desk. Filey golf course and others within a short drive. Putting green on site. Whilst the property is all on one level, it is not really wheelchair accessible. There is a large wheelchair accessible beach house available on the site - contact the bay direct if interested. Sauna and steam room on the pool side. Free of charge (over 16s only). A few mins walk to pool (free), with sauna and steam room on poolside. 20metre pool for swimming and other activities (aqua-aerobics, water walkers etc provided for a fee). A perfect getaway for families, couples and friends. Room for up to 5 (plus baby). To avoid the OD/home away "service fee" for online payments, we accept alternative payment methods - bank transfers, cheques and paypal. Please ask about these if interested, when you make an enquiry. Dogs welcome - up to two well-behaved dogs (maybe more if small) welcome with prior agreement, for No extra fee in 2017. Free unlimited wifi. Non-smoking throughout. The property is set within almost 90 acres of beautifully landscaped parkland, including children's play area, football pitch, wildflower meadow, fishing lake, putting green, tennis court. There is a pub, cafe and shop/pharmacy on site. Private road down to the beach. Free use of heated indoor pool, sauna, steam room and gym. Linens, towels, tea-towel and welcome pack all provided for your arrival. The property is professionally cleaned before and after your stay. Filey, Filey beach and the surrounding area is well worth a visit. We were lucky and had great weather. The Bay Resort is also well designed to suit your needs with many amenities catered for. We felt the shop was rather lacking in good food and typical necessities and would put the icing on the cake if it provided an improved selection. Beautiful property and in a great location on the bay site. Beautiful property which Paula has added alot of extra touches too which made our stay perfect. Property has everything you need for a great holiday. A great long weekend in this lovely beach house. A fantastic beach house on The Bay Holiday Site, well equipped with everything you need for a great holiday, clean and we were warm with the very efficient heating and log burner as well. Would recommend 100%. Thank you Paula and Tim for nice break. We are just home from a fantastic stay at Seaurchin Beach House! The house was great, beautiful decor, very well equipped in all areas including toys/dvds/games as well as everything you need in the kitchen. We loved the outside furniture too & used it for breakfast everyday! Thank you very much for a brilliant holiday! Beautiful chalet, very well equipped and appointed in a lovely setting. Very nicely laid out, ideal for families. Lots of books, dvds and games to keep you amused if the weather is not kind to you. Lovely setting very close to the beach. 10 minutes walk to the sandy beach which stretches for miles, and is suitable for swimming and body-boarding. 3 miles drive into the seaside town of Filey where there are lots of shops including Tesco supermarket. Just a short drive to Bempton RSPB reserve, Sewerby Hall and Zoo, Bridlington, Flamborough, and a bit further to Scarborough (8 miles). Whitby and Pickering are around a 40-50 min drive away but great for a day trip or a ride on the renowned North Yorkshire Moors Railway. Flamingoland is 40 mins drive. The beautiful city of York, and the port of Hull (the Deep aquarium is worthy of a visit) are around an hour. We have owned Sea Urchins Beach House from new in 2015. If you have any questions which we haven't covered in the description, please do email us. Booking Notes: To avoid the new service charge of 6-8% of rental amount, please ask about our alternative payment methods (paypal, bank transfer, and personal cheque). A non-refundable £150 deposit is required on booking, with the balance payable 4 weeks prior to stay. A security bond of £150 per visit will be charged at the time of final payment and refunded within 2 weeks of visit end providing no loss or damage has occured. If the booking is within 4 weeks of arrival then the full amount (and security bond) is required at time of booking. Changeover Day: Changeover day is usually Monday, Friday or Saturday. However, other days will be considered particularly in low season. Check-in usually from 4pm, check-out by 10am. Notes on prices: Price includes free pass to leisure facilities and a welcome pack. Free unlimited wifi. It also covers a full clean before and after your stay, beds made up for your arrival, towels and utilities. One or two small dogs permitted, no extra fee for bookings taken in Jan 2016. For breaks from October to February inclusive, we provide logs and kindling for the wood-burner.